Beautifully furnished apartment on superb new complex. Car is not essential as location is close to all amenities. Absolutely ideal for relaxing, peaceful and healthy break in The Central Algarve. All that Albufeira has to offer is right on your doorstep. Beautiful manicured gardens and sunbathing areas around two pools. Floodlit tennis court. Secure gated complex in quiet but convenient location. Luxury bathroom with jacuzzi bath and shower. Beautifully furnished lounge, bright and comfortable. Double sofa bed, dining suite, TV with English Channels and DVD player. Selection of DVD's and books for your use. Fully equipped with fridge/freezer, fan oven, microwave, toaster, kettle, iron and ironing board - all that you need for home from home living. In the vicinity of some of the best courses in Europe. Outside: Sun loungers at the pool.Dining suite on the balcony for alfresco dining with a wonderful view of the marina and ocean. Tennis court on the complex, we supply tennis rackets and tennis balls for our guests. Cleaning / Towels / Linen / Maid service: Towels and linen provided. Meet and greet, welcome packs and maid service available on request. The owners could not have been more helpful or gracious hosts. The condo was perfect for my husband and I. We sat out on the balcony every night and used the pool a couple of times. A market and old town albufeira are within walking distance. I was very sorry to leave. I could've easily spent weeks in the area. Highly recommend. We will be back! We stayed here in July/August and were very impressed. Lovely pool and sea view. Very hilly walking around though as it's very high up! Taxi from old town was about 7€ At night. Will be back. Many thanks for your kind comments Jade. We are proud of our apartment and we want all of our guests to have a great holiday experience. Perfect holiday, stunning apartment loved every minute. Many thanks Danielle for your kind comments we always want our guests to have a great holiday experience. Our apartment is great location very comfortable. Great views. Wonderful apartment, in a lovely area, the views over the marina are beautiful. The apartment is spacious, well equipped and beautifully decorated. All communication with Karen and Mark was a pleasure, so helpful, will return again. The area is quiet and relaxing, walking distance to beach front and restaurants, a steep walk back up but if you walk up past the main square there are taxis and cost around €4 so not so bad after a meal or night out. On our last day we took a Tuk Tuk trip it was great fun and well worth it, Paulo our driver showed us 3 beaches off the beaten track with lovely sand, wished we had found them at the beginning. Great holiday, enjoyed every minute. Short and pleasant stroll to Fisherman's beach and the other Albufeira beaches. Less than 30 minutes to Faro Airport. A transfer from the airport can be arranged. All facilities are very near, so car hire is not essential. All that Albufeira has to offer is right on your doorstep. Zoo marine a wonderful family day out is only 15 mins from the apartment. Changeover Day: flexible on changeover day. Notes on prices: Prices are based are based on 2 persons per weekly stay. 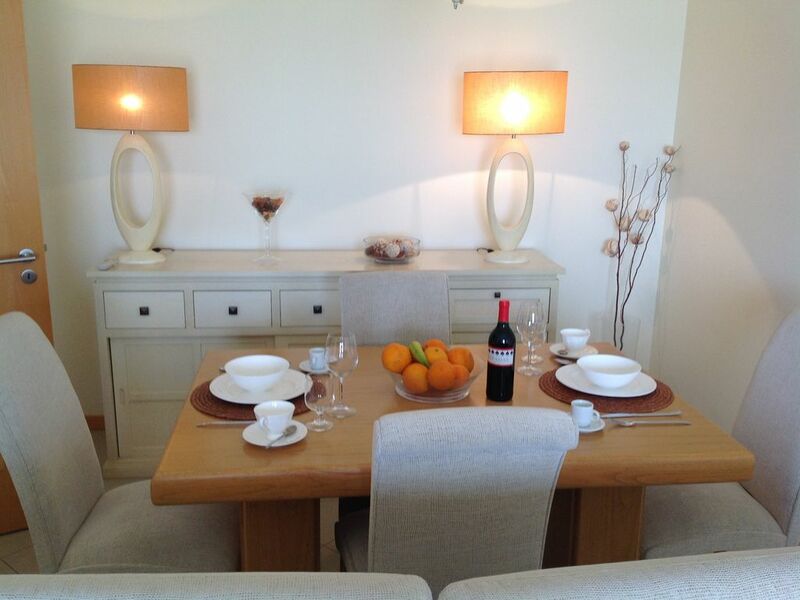 Additional guests(up to 4 max) charged @£50 per person a week.